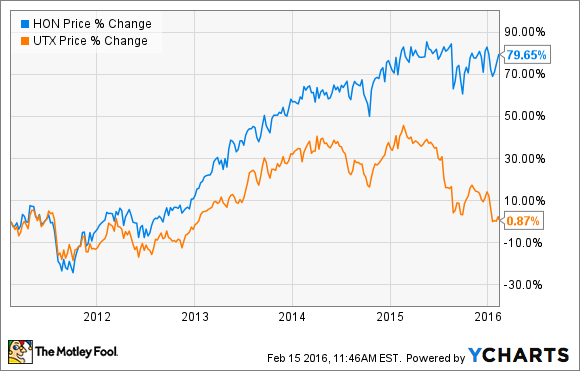 Which aerospace and construction giant will outperform the other in 2016? 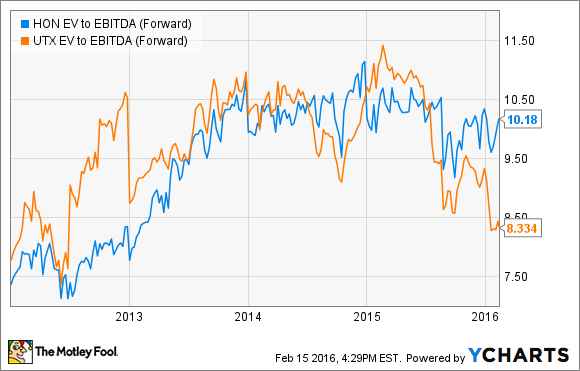 United Technologies (NYSE:UTX) or Honeywell International (NYSE:HON)? Both companies have heavy exposure to aerospace and global construction markets and therefore face similar headline risks. In addition, both are going through transition periods in 2016. The changes will compromise revenue and earnings in 2016 but are designed to ensure long-term earnings and cash flow generation. So which stock will win out this year? A look at valuations shows a premium for Honeywell's stock. EV/EBITDA represents enterprise value (market cap plus net debt) over earnings before interest, tax, depreciation, and amortization -- a useful way to compare two companies with different debt loads. Lower than previously expected commercial aftermarket sales, principally from provisioning sales on Boeing Company's 787 plane. I've discussed how United Technologies and Honeywell are shaping up for 2016. The key points are as follows. It's not going to be a banner year for the company's headline numbers, and management is expecting significant operating profit declines in three of four segments. Management is trying to increase Otis' installed base to generate more profitable long-term services demand. The company undoubtedly faces headwinds with Otis in China (a key market), and ramping up production on aero engines is never an easy task. Meanwhile, the merger of Tyco and Johnson Controls could put pressure on United Technologies' fire security and climate controls products, in which it competes, respectively, with Tyco and Johnson Controls. 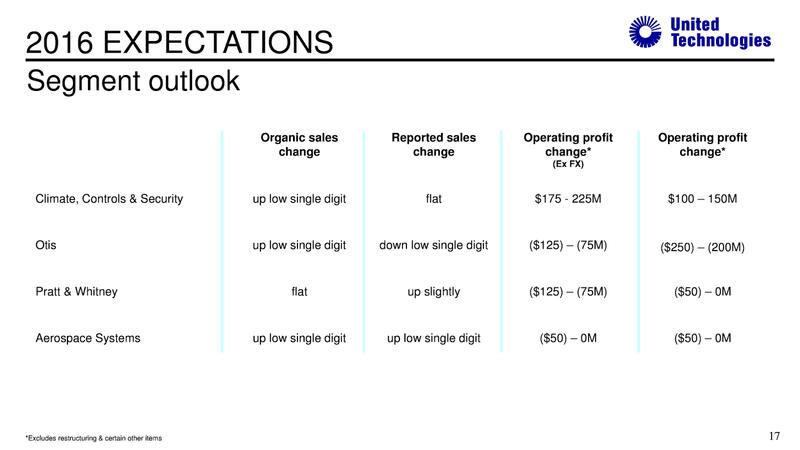 The company's outlook is best summarized in a graphic from its first-quarter earnings presentation. Its core organic sales growth is similar to United Technologies', but margin expansion is leveraging EPS and free cash flow growth -- all in line with its five-year (2014-2018) plan. Moreover, underlying free cash flow is better than it looks. 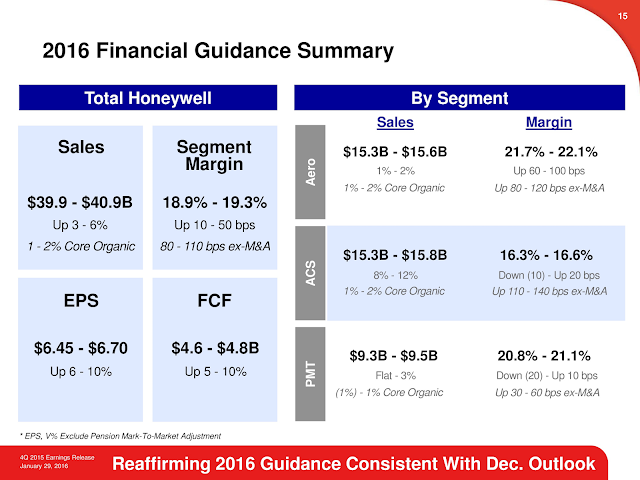 Honeywell is investing in growth as part of its plan. As such, free cash flow conversion from net income in 2015 was around 91%, but management expects to get back to a 100% conversion rate by 2017. In other words, a combination of margin expansion and relatively fewer capital expenditures in future years should see Honeywell's free cash flow expand in the future. In common with United Technologies and General Electric (NYSE:GE), Honeywell faces some near-term headwinds in its aerospace operations -- Honeywell is giving incentives to position itself on new aerospace programs. Its performance, materials, and technologies segment also faces risks because of its oil and gas exposure, and automation and controls solutions has China exposure. It doesn't really have any effect on us. ... [T]he diversity of opportunity that we talk about for the company in total applies to our aerospace business, also. We're tied to basically everybody. And if you take a look at what's happening in the aerospace industry, the biggest thing for us is that flight hours increase. And flight hours last year were up 4% or 5%. They're likely to be up 4% to 6% again this year. For United Technologies, Otis' China exposure is a concern, but Honeywell will also be hit if China's growth dives. Similarly, both have exposure to aerospace and construction, while Honeywell is more exposed to oil and gas. Undoubtedly, Honeywell has an enviable recent history of execution, and Pratt & Whitney's geared turbofan production ramp will also create challenges.